Wild Pink Salmon is sustainably caught in the cold, clear Alaskan waters by local fishing families. Their skinless and boneless fillets are packed and cooked just once to retain their nutritional potency and natural juices, containing an average of 340mg EPA and DHA Omega 3 per 2oz serving. Their salmon are canned fresh upon catch, not from previously frozen fish. This provides superior rich flavour and soft texture. 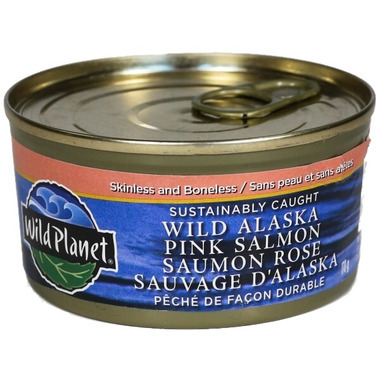 Wild Planet Pink Salmon is a perfect choice for sandwiches, a flavourful salmon spread and more.